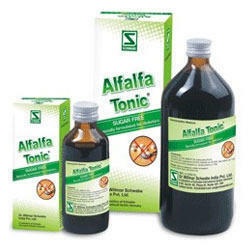 As an acclaimed entity, we are highly engaged in offering a superior quality Alfalfa Tonic - General. Additionally, our quality controllers keep an eye on the whole range at every stage of production to ensure its overall quality. authentic physical and mental restorative- increases appetite, digestion and assimilation. NL Alfalfa Tonic is a general tonic for ladies , gents & children which Increases Appetite, Tone up Digestion, Improves Mental and Physical Vigor, Useful in Debility after Exhausting Diseases, Nervous and Physical Prostration, Tired and Weak Children, Weakness in Old Age and Anemic Persons. Alfalfa Tonic: It strengthens the nervous system, improves appetite and digestion, and reduces mental & physical fatigue. Alfalfa Tablets: it strengthens the nervous system, improves appetite and digestion, and reduces mental and physical fatigue. Indications : A specially formulated growth supplement for growing children.lmpro, es appetite and strengthens immune system. Compositions: Each 5 ml contains.